Emei Qigong is a simple, powerful way to create harmony in your life. The strength and purity of its methods, refined over nearly eight centuries in a monastery on one of China’s most sacred Buddhist mountains, are a rare treasure. Practicing for as little as 45 minutes once a week brings remarkable benefits. Wuji Gong, the primary form of Emei Qigong, rebalances your Qi, or energy, in a way that is uniquely attuned to your individual needs. Practitioners enjoy dramatic improvements in physical health, emotional balance, mental acuity, and spiritual understanding. Join in at a group practice. Both beginning and advanced students are welcome, and it's a great way to gain familiarity with the Wuji Gong moving practice. Make an appointment for a private coaching session. I'll work with you to design a personalized Emei Qigong practice, including treatment sessions if that's appropriate. Email me and let me know you'd like to be alerted when I schedule my next four-day Level 1 training (which will probably be in Sonoma County, probably in the fall). Learn about Changing the Moving Program of Life, the Level 2 Emei Qigong practice. I will be teaching Level 2 later in 2014. My name is Tyra Ferlatte and I’ve had the good fortune to train with Grandmaster Fu Wei Zhong, the 13th lineage holder of the Emei Linji Qigong School of Sudden Enlightenment, since 2000. 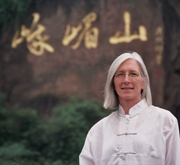 Emei Qigong has transformed my life, and I would be delighted to share it with you. Sign up to receive an email announcement for future seminars, and please feel free to contact me at with questions. At Emei Mountain, the birthplace of Emei Qigong.